In honor of the 20th anniversary of ‘Menace II Society,’ I proudly present this multipart retrospective. The current chapter is posted below. To read the previous chapter, please click here. Thank you, and enjoy! 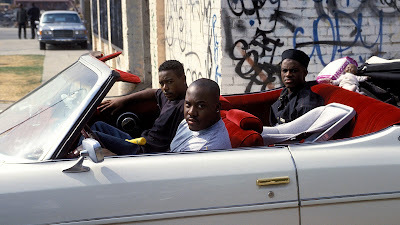 When Tupac asked Allen Hughes to direct the video for “If My Homie Calls,” the filmmaker was hesitant. He didn’t much like the track, but he needed Tupac to play the lead in his movie. New Line Cinema agreed to bankroll Menace II Society with the understanding that a platinum artist would be cast in the lead. Tupac didn’t have a platinum plaque yet, but his star was certainly rising. His tour de force performance in Juice was nothing short of a revelation. He’d also landed a lead role in John Singleton’s sophomore effort, Poetic Justice. Against his better judgment, Allen took the job. During the shoot for “If My Homie Calls,” Allen noticed a change in Tupac’s behavior. As Shock G of Digital Underground once observed, Tupac began each day with a freshly rolled blunt and a glass of Hennessey. He came by his weed habit honestly, having inherited it from his mother (He admitted as much on the Arsenio Hall Show in 1993). However, his appetite for such vices had become insatiable. Throughout the shoot, he made all sorts of weird requests. At one point, he wanted to appear as a White man. That wasn’t in keeping with the concept of the song, which revolved around Pac’s devotion to his friends. Allen appeased him to a point, but maintained control of the production. John Singleton made a cameo appearance. 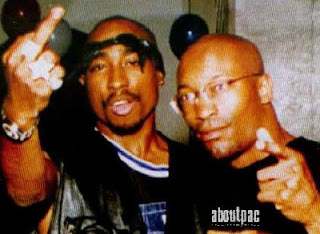 Tupac (Left) with John Singleton (Right). 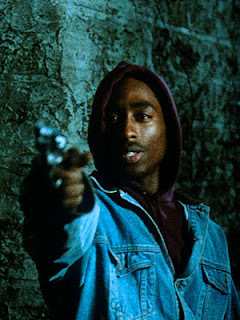 Tupac agreed to appear in Menace, but not as the lead. He’d formed an alliance with John Singleton, whom he saw as the Scorcese to his De Niro. Allen was satisfied, as was New Line Cinema. No matter what capacity Pac appeared in, his presence would surely broaden the film’s commercial prospects. Instead of Caine, he would play Sharif, an ex-gangbanger turned Black Muslim. New Line allotted Tupac a salary of 300,000 dollars for three weeks work. The amount was considerable, given the film’s meager 3.5 million dollar production budget. With a “platinum recording artist” having joined the cast, the project was officially a “go” at New Line. However, Allen sensed a gradual darkening of Tupac’s aura. Despite his unstable childhood, Tupac never resorted to violent criminality. He ran the streets, and even cavorted with some shady characters. For a while, he tried selling drugs. Though aimless, he never became a true felon and never did any jail time. After all, he had the heart of Renaissance man. However, his rise in the entertainment industry coincided with a rise in his criminal profile. About a month before the release of 2Pacalypse Now, Tupac filed a 10 million lawsuit against the Oakland PD. He claimed that a group of officers beat him mercilessly for the crime of jaywalking. He wore the scars and bruises from this incident like badge of honor, proudly displaying them during a televised interview. On August 22nd, 1992, Tupac performed at an outdoor festival celebrating the 50th anniversary of Marin County, CA. After the festivities, he courted his fans. An altercation ensued, resulting in the accidental shooting death of 6 year old Qa'id Walker-Teal. An angry mob then chased Tupac and stepbrother Maurice “Mopreme” Harding to a Sheriff’s substation. Both were detained, questioned, and released. No criminal charges were filed. Qa'id’s mother later filed a wrongful death suit against both men. Ballistics tests found that the bullet which killed the boy had not been fired from the Colt Mustang in their possession at the time. The case was settled out of court for a sum of 300,000-500,000 dollars. Tupac’s label, Interscope records, picked up the tab. Such incidents aside, Tupac’s professional career was off to a promising start. In hindsight, it’s easy to see why Allen Hughes wanted to work with him. Still, Tupac’s behavior gave him pause. His slowly changing character became even more apparent when he and Allen attended a screening of Juice together. The film was tragic coming-of-age tale set in Harlem, NY. Tupac played the brooding sociopath Roland Bishop. It was his feature film debut. Tupac as Roland Bishop in Juice. During the screening, Allen saw his friend become mesmerized by his own performance. He’d finally found the niche he’d so desperately been seeking. 2Pacalypse Now had a sizeable following, but it hadn’t yet broken through to the mainstream. Pac’s early music had a scattershot feel. It was an uneasy meld of political activism, Black consciousness, and street thuggery. There were also moments of sensitivity and joviality. Though obviously layered, his persona hadn’t yet coalesced into something that the masses could connect with. In hindsight, the professional growing pains Tupac experienced early in his career were inevitable. He’d always been the proverbial “man without a country” during his formative years. All of the moving around didn’t allow him to develop deep roots anywhere. In his mind, The Black militant teachings of his mother were often contrasted with the street level values he learned elsewhere. Via his training as an actor, he often absorbed the characteristics he observed in others. His New York accent soon gave way to a northern California drawl. He became enamored with Los Angeles gang culture, adorning his body in the “Black Line” tattoos often sported by gangbangers. He also wore the railroad handkerchiefs that bangers used as gang signifiers. Yet, he still wore Timberland boots, which had become a staple of NYC street fashion. Every now and again, his old accent would rear its head. This rather unfocused aesthetic would eventually endear him to fans around the world. However, it was still in the larval stage. In Roland Bishop, Tupac found what he’d been looking for. 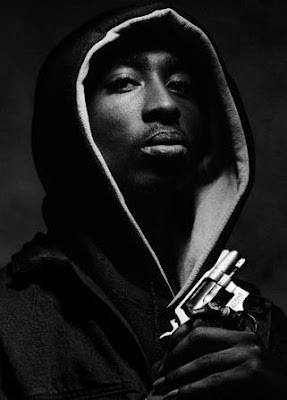 The general public had a hard time connecting with the complex character he introduced on 2Pacalypse Now. Perhaps that unique brand of complexity would be better received if filtered through the perspective of an outlaw. After all, Americans love outlaws. It was a light bulb moment akin to the apple falling on Sir Isaac Newton’s head. Pac would apply the theories of method acting to his rap persona. Other rappers were just playing the part, but he would be the first to actually live it. This approach would ultimately pay off a thousand fold, but it would also be a pyrrhic victory. One of the first real casualties would be Pac’s relationship with Allen Hughes. CLICK HERE TO READ PART 5!